The Latest on the New Coastal Radar - Hi, friend Climate and Weather Information, in this article entitled The Latest on the New Coastal Radar, we have prepared this article well and concise to be easy to understand for you to read and can be taken inside information. hopefully the contents of the post that we write this you can understand and useful. okay, happy reading. A number of you have asked about the status of the new coastal weather radar--the one destined for the Washington Coast. At the recent annual meeting of the American Meteorological Society, several of us had the chance to sit down with the NWS folks that are responsible for the installation of the new radar. Let me tell you what we have learned. Bottom line: the National Weather Service is confident that the new radar will be operational by the end of September (2011). 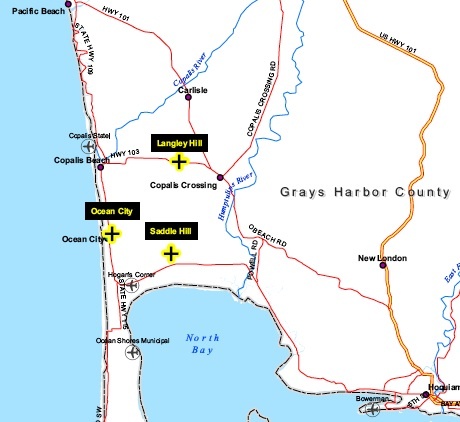 First, the location of the radar is now public knowledge: Langley Hill in Grays Harbor County (see map). A wonderful location, with clear views out to the Pacific Ocean (see coverage map below for .5 degree elevation angle). And the radar will able to see the heavy precipitation on the windward side of the Olympics and over the Willapa Hills. The National Weather Service is close to signing the final paperwork for leasing that site. Second, the National Weather Service now has our radar in hand. This is not a new radar, but one used for training purposes by the military (and the only one available) and identical to the radars used by the NWS over the rest of the country (known as the NEXRAD or WSR-88D radars). I was told it was "lightly used" , sort of like buying a used car from an elderly grandmother. It will be completely refurbished and updated before installation. Using a preexisting radar not only saves money, but the NWS folks know how to maintain and service it. They were nervous about getting a new radar--one different than the current network. 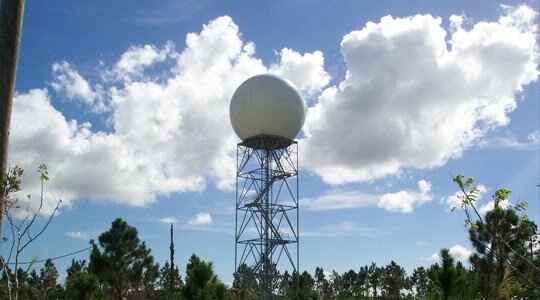 Third, our radar will be one of the first in the nation to be updated with dual-polarization. 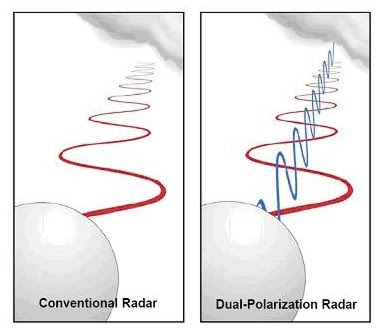 All the current radars are single polarization, which means the electromagnetic radiation it emits has only one orientation--horizontal (see figure). In dual polarization, two orientations (horizontal and vertical) are emitted and received. Why is this good? Well, by getting the two orientations all kinds of magic is possible---determining the shape and type of precipitation, getting a much better handle on the intensity of precipitation (especially in terrain), and more. Eventually all the NWS radars will have it, but this will be one of the first. Fourth, our radar will be the ONLY one in the nation using a zero degree scan angle. Weather radars scan in two ways. First, they constantly turn in azimuth (0 to 360 degrees). During the first scan the antenna is directly at an angle .5 degree above the horizon. Then it does a scan at 1.0 degrees, then 1.5 degrees, etc. Here is a figure that shows you the height of the radar beams for the various scan angles close to the radar (up to 120 nautical miles, 220 km). Now the lowest scan is near the surface close to the radar, but get 100 km out and the beam is 1000 meters up in the air! 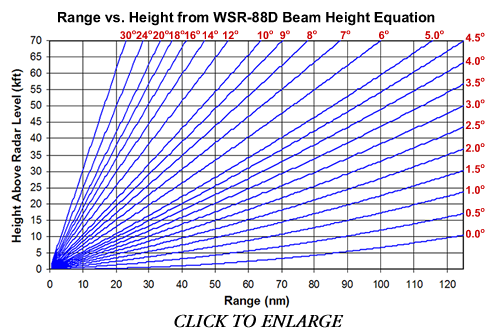 And at 200 km out the beam is 2000 meters (over 6000 ft) above the surface. So you are missing what is happening lower down. These radars can view 300-400 km out, so you can miss a lot at low levels, particularly at a distance. And WE want to see as much as possible at low levels over the Pacific! Several of us have pushed the NWS to do something special with this radar, allowing a zero degree angle, and they have agreed. This will allow us to see much farther out at low levels than normal and will be a boon for viewing weather out over the Pacific. Again, no other NWS radar in the country has this capability--hopefully our radar will inspire the NWS to try this elsewhere. During the next few months, a lot of action will begin at the site. Trenching for utilities, putting down a concrete pad, erecting a building for the generator, putting up the tower, and more. The radar should be installed midsummer. By late September a local meteorological revolution will occur and for the first time one of the stormiest areas in the country will be able to see incoming storms. And folks in the coastal communities and those in the marine industries of the Washington Pacific coast will have what the rest of us have enjoyed for years...decent weather radar coverage, with all the safety and economic benefits. Finally, I should note that Senator Maria Cantwell deserves credit for getting the resources to make this happen. 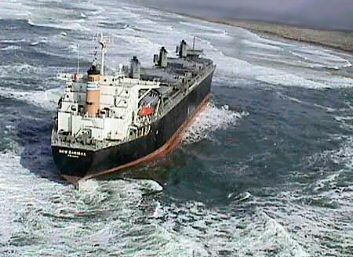 With good radar coverage, incidents like the New Carissa grounding (on the Oregon Coast), will hopefully be less frequent. Thank You and Good article The Latest on the New Coastal Radar this time, hopefully can benefit for you all. see you in other article postings.